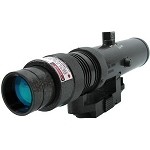 With a durable, shock-resistant metal construction and an all-black unreflective matte finish, the Newcon Optik I/R 200 is an extremely powerful infrared illuminator for use in conjunction with a night vision device. 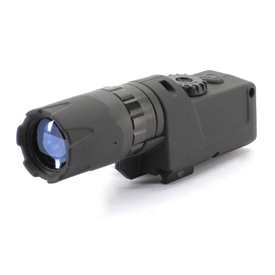 The 820-nM wavelength beam can be adjusted in its angle of illumination to suit the conditions of observing, and the I/R 200 also has the capacity to be mounted upon the many varied night vision devices, thanks to the integrated mounting system. Or if preferred, mount the I/R 200 to a monopod or tripod using the included 1/4"-20 threaded socket. This IR illuminator is not eye-safe.